Monika Schiavo, Waverly Rare Books at Quinn’s Auction Galleries American presidential elections have always been newsworthy events, often providing unexpected twists and turns as candidates travel across the country speaking to voters. The 2016 campaign for the top job at the White House was no exception. While modern campaigns now make use of Twitter and Facebook, an item coming up for auction reminds us that the art of political debate goes back to our country’s founding. Most of us know that the phrase “stump speech” comes from the tradition of campaigners sounding off from the top of a sawed-off log. This activity raised their profile – literally – and gave them a chance to connect to a wider audience. The tree stump in the photo(s) is a reminder of a time when someone running for public office delivered speeches from a homely piece of wood instead of a fancy raised platform. This particular item was a gift from the 40th President of the United States and the First Lady, Ronald and Nancy Reagan. Imprinted on top with the double-pointed arrow brand used at their vacation ranch, Rancho del Cielo, it is a wry reminder of one small but significant part of our country’s political history. You can read more about this unusual item and see other rare and remarkable pieces of American history at www.quinnsauction.com. One look and you gasp. There’s a postcard from Dover, Del., of a shirtless black man being whipped in front of a crowd of white boys and men. “THIS IS THE WAY WE DO ’EM UP HERE,” the sender wrote on the back, amid the more standard postcard pleasantries of 1938. There are heavy, iron handcuffs and their double-sided key. A branding rod with the letter J. Both used on humans. 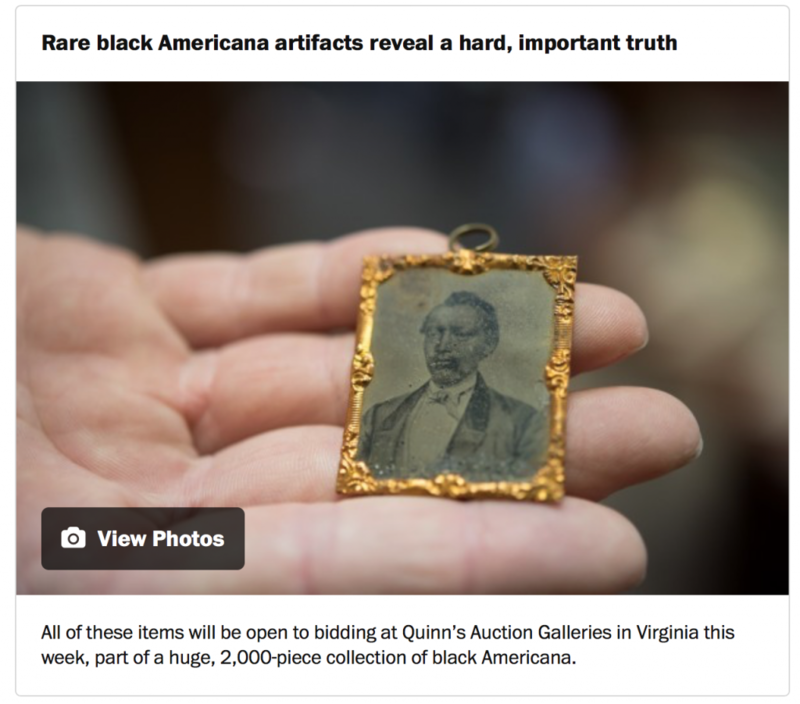 All of these items will be open to bidding at Quinn’s Auction Galleries in Virginia this week, part of a 2,000-piece collection of black Americana. It’s a trend in the collecting world — buying up these Aunt Jemima cookie jars, pieces of the human slave trade and literature from our country’s shameful past. Some people buy them to get them out of circulation, to prevent the children of today and adults of tomorrow from ever seeing the way we treated other humans. And to keep racists from having palpable totems of their twisted beliefs. But like Nazi or Holocaust memorabilia, it’s complicated. Yes, it’s our history — and it’s awful. But there’s one important lesson to history: We must never forget it. And I’m not just talking about never forgetting the Big Baddies — plantation owners, human slave traders and the like. It’s easy to believe we’re nothing like them. The items that are part of this collection — the caricature salt and pepper shakers, the cereal trading cards of awful slave scenes that kids got with their breakfast, the Currier & Ives prints ridiculing black Americans that were displayed on the walls of the turn-of-the-century everyman like Thomas Kincade prints are hung today — remind us how accepted such bile had been. Racism ran — and still runs — through every thread of society. Johnson was friends with the collector, Howard Wolverton, a New Jersey high school history teacher who used the memorabilia as part of his curriculum. Ignoring how casually America ridiculed and belittled black Americans — from household products with the N-word in the name to home decor that celebrated slavery — isn’t telling the whole story, Wolverton believed. And his collection is an amazing, cross-class indictment of America’s original sin. And along with the despicable, the collection has the celebratory, which itself becomes sad. Wolverton, who died in 2005, had what may be the only surviving tintype — like a metal photo — of William Tillman. That’s part of America’s racism, too. Tillman was one of the Civil War’s great maritime heroes. He was a steward and cook aboard the merchant schooner S.J. Waring when it was boarded by confederate privateers. Being the only crew member allowed to walk freely (they needed his help), Tillman staged a one-man attack in the dead of night to kill the pirate captain and turn the ship around, back to New York. His valor got him a $6,000 reward from the government, newspaper accolades and a spot in P.T. Barnum’s show, where he regaled his heroism. If a white man pulled that kind of coup, we’d be driving on roads named after him. Never heard of him either? Yes, forgetting, ignoring and sometimes erasing the strength, heroics, bravery and fortitude of black Americans is also part of America’s continuing racism today. And how different, really, is the 1938 public whipping in Delaware from the videos we see on a regular basis of black Americans beaten, harassed and killed by police officers today? Or the racist song of Oklahoma frat boys — “There will never be a N-word in SAE”? Or the Arizona girls who thought it would be funny to spell the N-word out on their T-shirts? We’ve already forgotten. Featured in the Washington Post on Tuesday, February 16, 2016. See the original post here. To see consignment opportunities in our Falls Church location, please click the link at the left of the page. We are currently accepting consignments in our Central Virginia location for all auctions. 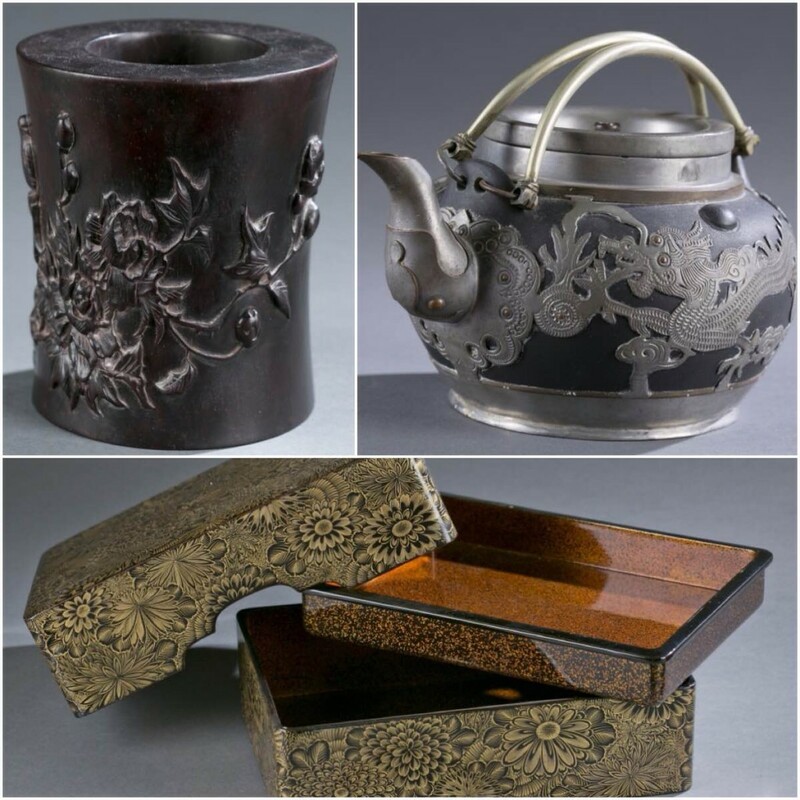 This includes Weekly, Fine & Decorative Arts catalog, and Collector’s Series auctions. For consignment inquiries please call our Central Virginia office at 434.293.2904 or email info-cva@quinnsauction.com. 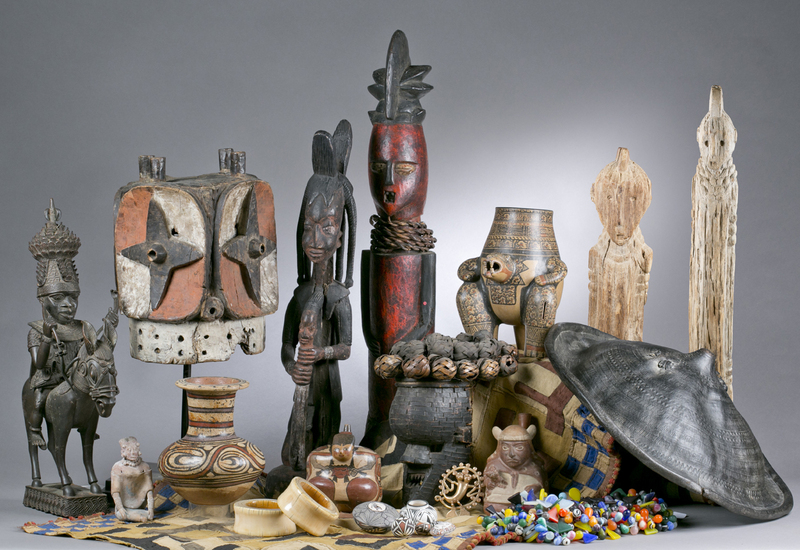 We’ve got an exciting Ethnographic Art Auction planned for Saturday, October 24, 2015 at 11:00am in our Falls Church location. Quinn’s has assembled an amazing cross-section of Ethnographic and Tribal Art including African, Oceanic, Pre-Columbian Pottery & Gold, Textiles, Native American Pottery & Kachina Dolls, and much more. 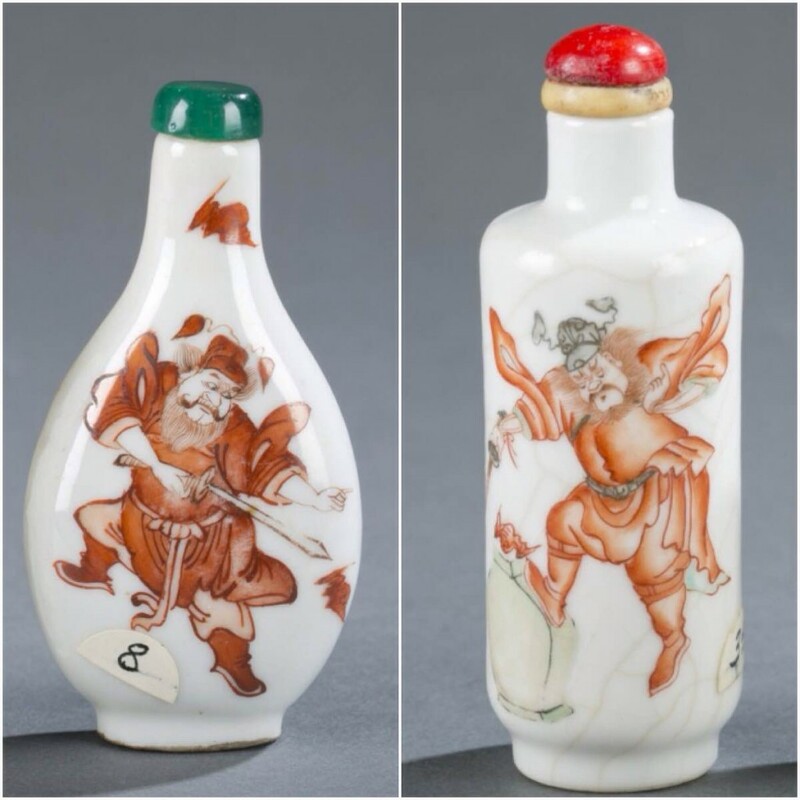 See the auction catalog by clicking here. See the entire catalog by clicking here. 1. Condition of Goods: In publishing the catalogue, Quinn’s Auction Galleries – Central Virginia endeavors to accurately describe all items being sold but all property being offered is sold as is. It is advisable that bidders personally inspect items. No statement in the catalogue, bill of sale, invoice, or any representative or employee of Quinn’s Auction Galleries – Central Virginia shall warranty, represent, or assume liability with respect to age, condition, size, quality, variety, importance, provenance, or historical relevance of any of these items. Please note that catalogue photographs may have had size modifications for display purposes, or been trimmed to exclude framing, matting, and wide blank margins. Variations in color may occur due to digital processing. Quinn’s Auction Galleries – Central Virginia retains all rights to copyright and other intellectual property contained in the catalogue. 3. Title to Goods: Title to all merchandise shall pass to the successful bidder at the fall of the auctioneer’s hammer. The purchaser shall assume full responsibility for the lot purchased once title has passed. 4. Removal of Goods: Purchased items must be picked up or arrangements made for shipping within five business days of the auction. If after five business days the items are still in the building and/or Quinn’s Auction Galleries – Central Virginia has not been notified of shipping arrangements, a fee of $5 per business day per lot will be assessed. Items remaining at Quinn’s Auction Galleries – Central Virginia beyond a thirty-day period will be considered abandoned and reoffered for auction. 5. Shipping: Quinn’s Auction Galleries – Central Virginia does not have a shipping department. We have compiled a list of shippers in our area and can email or fax the list to you. Feel free to contact them directly to obtain quotes for the packaging and delivery of your items, or make your own arrangements. Purchases will be released to the shipper when they are paid in full (by credit card approval or when checks clear the bank) to Quinn’s Auction Galleries – Central Virginia . Payment for shipping is due directly to the shipper. Please notify us of the shipper. 6. Payment Terms: All accounts are to be settled within five business days of the end of the sale, with payment in United States dollars by cash, money order, travelers’ check, Visa, MasterCard, or Virginia personal check. Credit/Debit cards are only accepted for amounts up to $1000. There will be a 4% processing fee for all Visa/Mastercard purchases. All higher amounts will need to be approved. Only personal checks from the state of Virginia will be accepted. All merchandise will be held for ten days until checks are cleared. All others using checks must obtain prior approval. Approval will be granted upon presentation of a letter of guarantee from an officer of your bank on original stationery. This letter should state an exact amount of funds guaranteed and should be presented to the cashier at time of registration. Quinn’s Auction Galleries – Central Virginia reserves the right to hold all merchandise paid for by check until such check has cleared and receipt of funds is verified. There will be a $25 fee on all returned checks. Quinn’s Auction Galleries – Central Virginia reserves the right to charge an additional 2% handling fee if bidders have not paid within fifteen days of the auction date. Please contact the gallery for wire transfer instructions. The buyer is responsible for any and all fees associated with wire transfers. 7. Sales Tax: Pursuant to the laws of the Commonwealth of Virginia, all sales, including buyers premiums, are subject to 5.3% sales tax. You may present a valid resale license and complete the necessary Virginia certificate for Sales Tax Exemption (available from Quinn’s Auction Galleries – Central Virginia). Lots shipped out of state are not subject to Virginia state sales tax. 8. Buyers Premium: 18% buyers premium for phone or in-house bidders. 21% buyers premium for live internet bidders. There is a 4% convenience fee for all payments made by credit card. 9. Gun Sales: All laws governing the sale of firearms will be strictly enforced. Firearms requiring registration will only be released to approved Virginia residents or Federal Firearms License (FFL) holders. Out-of-state bidders will need to make arrangements with their local FFL holder for transfer. 10. Errors: Quinn’s Auction Galleries – Central Virginia is not responsible for any typographical errors or omission in this catalogue. Quinn’s Auction Galleries – Central Virginia reserves the right to withdraw any property before the sale. 11. Exhibition: Our staff is present to answer questions and offer help with the auction process. Preview times: Monday – Friday: 10am – 5pm, Saturday 9am – 12pm, by appointment, and one hour prior to the sale. 12. Absentee/Telephone/Internet Bidding: As a service to our customers, Quinn’s Auction Galleries – Central Virginia will execute absentee bids if so authorized in writing under the provisions herein specified. The Absentee Bid Form provided in each catalogue should be clearly and completely filled out and accompanied by a valid credit card. All absentee bids will be executed competitively during the sale; items will be purchased for the lowest price possible. Quinn’s Auction Galleries – Central Virginia cannot accept buy bids. In the event of tie bids between absentee bidders and those in attendance, preference will be given to the attending bidder. If there are two absentee bidders that bid the same amount, the first received will be honored. Telephone bidders also should submit a completed absentee bid form. Upon receipt of a properly executed bid form, we will make arrangements to call you just prior to your lot(s) of interest being offered. Please note that we will have limited time to try calling you once. Make sure that the phone number you have given us is correct and that your line will be open during the auction. Successful buyers will be notified within three days of the sale. All bids should start at 50% of the low estimate. Quinn’s Auction Galleries – Central Virginia will not be responsible for any errors or failures to properly execute absentee or telephone bids. Absentee and phone bids will not be guaranteed after 12pm the Friday before the sale, and will not be accepted within two hours of the start of sale. 13. Agreement to Terms: In bidding on any lot here offered, the bidder indicates acceptance of these Terms and Conditions of Sale. The title of each lot passes when the auctioneer says “sold”. Thereafter, any loss by fire, theft, breakage, or any other cause is the sole responsibility of the purchaser. Merchandise must be packed and transported at the purchaser’s own risk and expense. If any employee or agent of Quinn’s Auction Galleries – Central Virginia shall pack or transport the merchandise, it is fully at the risk, responsibility and expense of the purchaser and Quinn’s Auction Galleries – Central Virginia shall not be liable for any loss or damage that may be caused by such employee or agent. 14. Bidder Responsibility: The bidder is responsible for knowing on which item(s) he or she is bidding. If unsure, the bidder should inquire or not bid. The winning bidder at auction has effected a contract and will be expected to pay for items in which you were evidenced to be the successful bidder. No sales will be voided and no items will be offered for resale. 15. Acceptance of Bids: The Auctioneer reserves the right to accept or reject bids in any increment. POOLS: Pools are illegal associations of dealers or collectors formed with the purpose of keeping down auction prices for the benefit of its members. They are not permitted at our auctions. 16. Check Out: If a checkout area is set up for small items, they will be released upon full payment and a paid receipt. Large items may be removed from the gallery once a paid receipt is shown to a staff member at the door. If a checkout area is not set up, small items will be given to winning bidders and larger items will be placed in a convenient area. Telephone inquiries may be made between 10am-5pm EST. 18. Sale Results: Results will be posted on our website by the next business day.